The much-hyped and consecutively sold-out INDICINELIVE! 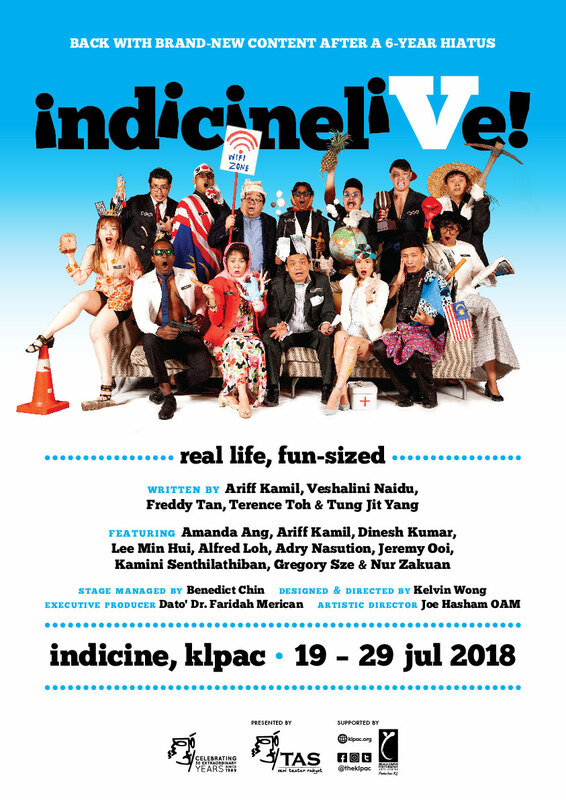 revue returns after a 5-year hiatus with slicker sketches and sharper parodies, crafted by a revamped team of the old and new. As our country seesaws between uncertainty and hope, there’s no better time for a generous help-ing of some real-life, fun-sized. First premiering in 2010, INDICINELIVE! (in-dee-SEE-nee-live-!) satirises the insane society we live in through a high-octane line-up of every-day characters, familiar situations, and parodies of songs we’ve heard and are all too familiar with. INDICINELIVE! played to packed houses and sold-out shows since its inception, with after-requests for second and third helpings in Kuala Lumpur, Melaka, and Singapore.